﻿Lawn Care You Will Love! We specialize in professional and affordable Lawn Care Service. We offer a full range of lawn maintenance services. Rather its a one time landscape makeover or a scheduled lawn care program we are excited to help make your lawn and landscape functional and healthy. Through our solution based lawn services such as our scheduled lawn care program we can ensure your yard and landscape will be looking green & clean, trimmed and maintained properly. With our scheduled lawn care service your landscape will look better than it has in years! Boise Idaho is a beautiful city with amazing views and a unique landscape. With our high desert climate residential and commercial Lawn Care offers a few unique challenges in achieving the green grass and healthy trees and shrubs we all desire. Through our experience we have learned exactly what helps keep your lawn green and landscape healthy. Boise Lawn Experts and our Yard Care Services can help you with one time lawn or landscape projects such as aeration, fertilization, tree trimming and shrub trimming. If you want a hassle free lawn and landscape our scheduled Lawn Care Service and Landscaping Service is perfect. Boise Lawn Experts works with our clients to help them achieve a functional lawn with affordable services and a professional staff. Boise Lawn Experts can help with anything lawn and landscaping related. Below is a list of our more popular services. At Boise Lawn Experts we are passionate about what we do, through personal and detailed Lawn Care Services our clients lawns are left absolutely stunning! Give us a call and lets see how Boise Lawn Experts can best help with your Lawn Care needs. We offer a convenient way for you to get your Lawn and Landscape in order anytime of the year. Our Lawn Care Service will help you and your Landscape transition from an out of control lawn to a beautiful landscaping experience. Boise Lawn Experts has the lawn and landscaping tools to tackle any lawn big or small. Did you fall behind in your lawn care this year? Need a hand to get on top of the long grass, leaves, over grown trees and shrubs? Through our experience we have handled every type of lawn, tree and shrub. Boise Lawn Experts can easily come in and get your landscaping looking green, clean and trim. 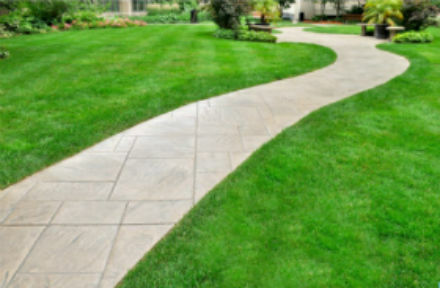 We will work with you on a yard care services to help improve the appearance and functionality of your yard. You will love our lawn care service in Boise, ID and our professional approach, We guarantee it! Moving? It can be a pain! Don't hassle with your lawn care and landscaping. Let Boise Lawn Experts handle it while you pack the truck & drive off in the sunset. Rest assured your Landscape will look amazing! With the lawn mowed, clean sharp edges and a trim & clean landscape it will make a big difference. Boise Lawn Experts would love to help! Every yard here in Boise can have its own unique lawn care needs. We have the tools for every lawn care job your could imagine. Some of our most popular one-time lawn care services are listed below. Winter in the Boise, Meridian and Eagle can be harsh on our landscape and vegetation. Let us help you get your lawn and landscape in order. Spring is a very busy time of year for your lawn and landscape as they are busy coming out of hibernation, sprouting awkward chutes. Much like wild hair. Did you know it is imperative to trim your trees and shrubs come spring? This will help focus the energy or growth of the vegetation in the best direction for you and your landscape. Don't wait until its too late call Boise Lawn Experts and get your Lawn Care Service scheduled now! ​Summer was amazing! Your yard was functional, your family made memories hanging out in your green grass enjoying your clean landscape eating lunch and playing in your nice green grass. 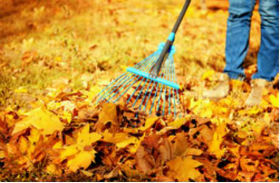 Rather you maintained your yard yourself or used Boise Lawn Experts Lawn Care Services, Fall has come and its time to prepare your lawn and landscape for the winter. The leaves have fallen and are everywhere. The trees and shrubs need a final trim before winter hits. As well the lawn care needs done and the lawn fertilized. this will allow for your lawn to have the proper nutrition throughout the winter. This is where Boise Lawn Experts come in. We do a full lawn and landscape weatherization. Within hours our expert lawn care professionals will come in and trim the trees, shrubs and hedges, rake and remove any debris left from the fall storms. The perform a lawn care service to ensure your lawn is ready for the winter months ahead in Boise, ID. We are passionate about yards! No, seriously we love what we do and the best way we know to achieve the ultimate lawn and landscape is through our Scheduled Lawn Care Service. Boise Lawn Experts offers a full service residential and commercial scheduled Lawn Care Service. A schedule maintenance program is the best way to ensure you have a clean and green lawn and landscape, with zero effort on your side. Our Lawn Care experts are well equipped with knowledge and equipment to get the job done, right! rather you need a hands off residential yard care solution or you have a commercial property you need maintained we would love to help. Through our scheduled lawn care service we not only maintain the appearance of your lawn and landscape but promote the health of your landscape and lawn. ​We have flexible levels of service which ensures we work with you to achieve top results while maintaining an affordable lawn care service. Let's face it they grow. Which is exactly why you need to trim your trees and shrubs appropriately. You want your shrubs and trees to maintain a natural look while being in control. You want the best looking landscaping in Boise and we can help! Boise Lawn Experts has the landscaping expertise to know exactly how to trim your trees and shrubs to maximize their beauty, functionality and health. We recommend trimming your trees and shrubs at least twice a year to help maintain the health and vigor of your landscape. When it comes to trimming shrubs, a natural look is preferable to most. While some clients like their shrubs trimmed into an art piece in the entrance. Boise Lawn Experts will take the time to listen to your and use our experience to develop a vision that is attractive and functional. ​When it comes to tree trimming and shrub trimming our experts know exactly what to do. Give us a call and lets see how we can help you with your lawn care and landscaping needs. This is a vital part of maintaining the health and desirable look of a green full lawn, weed free and clear of other non-wanted species. Each lawn is different and the soil needs will vary so we take a personal approach to each lawn. Our expert lawn care professionals will evaluate your soil and its nutrients to determine the best solution. We do recommend a scheduled fertilization program. ​Most yards in Boise would benefit form fertilization at least twice per year. Think of this as feeding your grass the proper nutrients it will need to endure and thrive in the upcoming season. Of course, Boise Lawn Experts offers a one-time lawn fertilization solution, for that boost you'll need today to properly care for your lawn and landscape. Depending on your soil our professionals will recommend a treatment schedule to help achieve the optimal lawn for you here in Boise, ID. We use only the best fertilization products which are safe and help make sure you have a green healthy yard throughout the year. 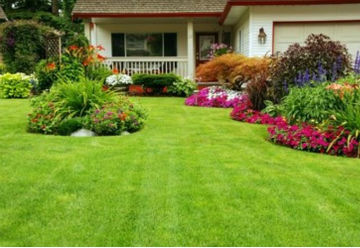 Boise Lawn Experts will work with you to achieve the best lawn care and fertilization solution. Just Call Us! We can help! ﻿Psssst.... This is a huge secret to a healthy lawn! We recommend Aeration at least once per year, depending on your lawn's thatch and soil density. Your lawn care would be simpler and your grass greener if you incorporated aeration into your lawn care routine, guaranteed! We recommend Aeration twice per year in most cases throughout Boise, Eagle, Meridian and Nampa. Once in the Spring then again in the Fall. Aeration in the Fall will loosen up the soil allowing it decompress after the beating it took over the Spring and Summer months. These are typically our high growth and high usage months which compresses the soil and really chokes the roots of your lawn restricting the growth and health of your yard. 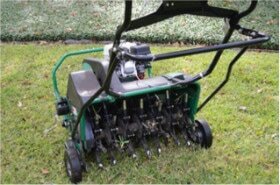 Essentially, aerating your lawn it allows the soil to absorb more water and nutrients. Spring Aeration is essential in setting up that perfect summer yard. The soil has been through a lot over the harsh winter months. By aerating our lawn in the Spring it will loosen up the soil and allow the roots to really grow and thrive as the grass moves into growth season. Get on our schedule Click to Call Now! Lawn Care at its Best! When it comes to your yard and landscape if you’re like many you would prefer a nice green lawn which was freshly cut and clean of debris. Imagine pulling up to your house Friday after work as you look over the landscaping you see your favorite pair of American Box woods trimmed to your liking, the grass never seemed to grow and looks amazing. The lines are clean and the grass is green! That’s the moment you realize this weekend is going to be a breeze. Agenda: Relax, BBQ and let the Kids play in the green full lawn. Our maintenance program is designed to be affordable, hands-off and worry free. In Advance: Thank you for your consideration. Through our professional consultation we work with you to evaluate your landscaping needs and help design a yard maintenance program.This scheduled yard and landscape maintenance will ensure a healthy landscape and vibrant yard throughout the year. When we think of a great yard and landscape this curb appeal is a great example. Give us a Call Now and see what our lawn service can do for your curb appeal. Offering lawn care services throughout Boise Idaho, Meridian, Eagle, Garden City, Nampa and surrounding areas of the Treasure Valley. ​As the summer comes into full swing Lawn Care in Boise becomes more and more important. Here in Boise it's not uncommon to have weeks of 90 plus degree weather. Along with this weather comes numerous challenges for our lawns. These three tips will help ensure your lawn remains healthy throughout the summer months. During this extremely hot season it’s important to water your lawn properly. Water your lawn at the wrong times or for the wrong length of time will affect the lawns ability to stay healthy and promote other species of plants and fungi to grow. Lawns should be watered about 1.5 inches of water per week in this extreme heat, typically an inch per week is good enough. You should water your lawns very early in the morning around 5am and if needed again in the afternoon. You want the ground to be fairly dry before nightfall. Having wet soil overnight will create an ideal environment for fungi to grow throughout the lawn. Watering for longer periods of time less frequently helps promote deep root growth and health. While watering more frequently with less water promotes surface root growth. Having Deep Healthy roots will enable your lawn to withstand hotter drought like conditions. The hotter weather makes is harsh on our vegetation and our lawns are no different. To help care for your lawn in these hotter months you should allow it to remain around 3 inches tall. This will help in a couple different ways such as less weeds, less water and greener grass. In order not to stress your lawn out too much it’s ideal to only cut 1/3 of the blade height when you mow your lawn. Longer grass helps reduce the number of invasive weeds that can find their way into your lawn. The longer grass doesn’t allow a lot of space or a lot of light down to the soil. This reduces the area weeds can grow and helps eliminate an optimal environment if a weed does find its way down through the grass into your soil. ​Lawn care becomes that much easier with a little longer grass. The amount of water needed is reduced as the longer grass helps prevent evaporation of the water in the soil. Your soil will hold water longer allowing the roots to utilize more water throughout the day. A simple natural way to help maintain a healthy green lawn is to mulch when you mow. Rather you use a lawn care service or mow your yard yourself, mulching is easy and very effective. Use a sharp lawn mower blade. A blade will allow the blade to be cut and not torn, which stresses your grass out further. As well a sharp blade helps to mulch the grass clippings into smaller pieces allowing for better decomposition. Cut your lawn frequent enough to where the grass clippings don’t overwhelm your lawn but can work back down to the soil. The grass clippings will help replace nutrients and water to your lawn promoting a healthy green lawn. Lawn Maintenance, Mowing, Edging, Fertilization & much more. Spring is getting off to a great start and so are our lawns. Make sure you ge tthe most out of your yard this year. Hire a professional Lawn Care Service, and rest easy in 2017!